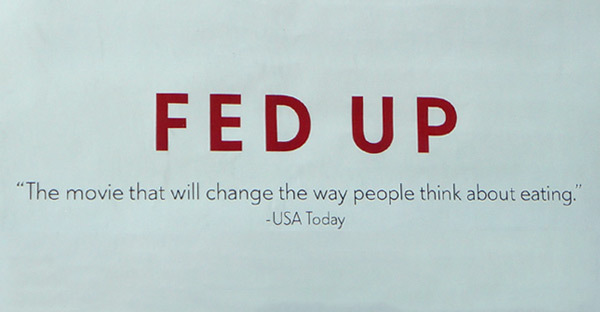 In case you missed it, a new diet and health documentary movie called “Fed Up” was released in theaters on May 9. I’ve never written a movie review before—in fact, I am not much of a moviegoer. But my wife, Karen, and I decided to see this one, partly because this topic has been my career and partly because it seems that an unusually strong public relations effort was mounted to get people to see it. But mostly, what specifically drew my attention was an op-ed piece by NY Times health science writer Mark Bittman who recommended it, so I took him at his word. First, for the film’s credits. It mainly speaks of a problem that almost everyone agrees on—the sickening sweetness of too much sugar, especially for children. Who can disagree? But this message seems to me to be the beginning, the middle and the end of the film and it took almost two hours to hammer home what appears to be an obvious truth. A second message blames authorities (especially a few academics) for shoving so much sugar down our throats, a thought shared by many discontented citizens these days. So, now, let’s look at some stories that failed to make it into the film. First, there is the title. It provides gravitas suggesting that the film is going to tell us what is the real cause of the big health problem that we suffer. They say it’s our excessive consumption of sugar that causes obesity that causes, in turn, other diseases, although they mostly left it to our imagination what these might be. Our really big health problem is obesity, so the film says, and if we could only eliminate this heavy-weight problem, our sickness would disappear. And, we can do this, of course, by eliminating sugar from our diets. So simple…..! This is a very reductionist idea that seriously short-changes the far more comprehensive diet and health connection. Obesity should not be considered an independent disease outcome or a stepping-stone to other disease outcomes. Obesity was first granted its own independent disease status, with its own medical code number, about twenty years ago to make it easier for physicians to charge a fee for their obesity-treatment services and to bring more public attention to the problem—or so it was said at that time. I was not supportive of this decision then and still do not do so today. Any disease with independent disease status suggested to me that treatments targeted specifically for obesity might be developed, like weight loss pills, bariatric surgery or counting calories. And so it has come to pass, with little or no gain in long-term health. Obesity is only one member of a broad spectrum of symptoms and illnesses, which are now known to share the same dietary lifestyle. And further, sugar is only one nutrient-like chemical member of a vast array of nutrient-like substances in food. It is unscientific and irresponsible for this film to target a specific cause of one outcome while ignoring countless other outcomes that share the same (collective) cause. I know of no evidence that were we to eliminate all sugar from our diets, presumably leaving the rest of the diet the same, we could rid ourselves of disease and restore our health. In a debate of sorts, four scientists, each having reputable research experience, compared their interpretations of the evidence for and against sugar, in its various forms of consumption (high fructose corn syrup, sugar-sweetened beverages, sucrose and/or fructose solutions) as a cause of obesity, diabetes and a few clinical indicators of these diseases. Their evaluations were just published in the April issue of Diabetes Care, the official journal of the American Diabetes Association. It may come as a surprise but the evidence showing sugar to be a major factor in obesity is relatively weak. There certainly is some evidence but closer examination shows that much of this evidence may be attributed to its contribution to calories or other factors not measured, an interpretation shared by both research groups. However you may choose which side of this debate you prefer, I am inclined to favor the argument that sugar is problematic even though the effect is less scientifically qualified than we all tend to believe. To make the film more authentic, the producers interviewed a large number of people they call experts on the topic of diet and health. In most scientific research disciplines, there usually are guidelines as to who qualifies as an expert. Based on the criteria used in my discipline, I have serious trouble agreeing that journalists (even those who are widely known) are ‘experts’. For that matter, I am equally concerned with some professionals (physicians and even nutrition and food science researchers) who allow themselves to be considered as experts simply because they may have a professional degree but have no relevant clinical or research experience. When these self-proclaimed ‘experts’ are less than candid about their professional qualifications and experiences, they tend to say almost anything they want. Thus, they are more inclined to rely on their personal and institutional prejudices, feeling free to cherry pick which cause and which effect to paint grand pictures. It would help if there were more transparency, which applies both to supporters and deniers of the connection between whole plant-based foods and their remarkable health benefits. The consequence of not being clear about qualifications and biases is that the public mostly cannot know who speaks sense and who speaks nonsense, who speaks truthfully and who tells lies. In such a maelstrom, important ideas can easily be destroyed. The film hammers the food industry who contributes to this ‘sugar-dependent’ obesity problem—an understandable observation—but reserves its most critical comments for government advisory panels who make food and health policy. They begin with the 1976-1977 McGovern Committee of the U.S. Senate who initially advocated a “low fat” diet, a position affirmed by a few more advisory committees on diet and health during the 1980s and 1990s. According to the film, consumers entered this epic journey adopting low fat diets and actually got fatter! This happened, so they say, because we replaced the missing fat by increasing the consumption of more and more sugar-dense products. False! During this period (from about 1975 to about 2000), I know of no evidence that we actually ate less fat. If anything we consumed more fat (reviewed in The China Study, page 95). Moreover, the film refers to ‘low fat’ diets as those containing about 30% of diet calories that was recommended by policy makers. This is not low fat, at least when compared to the whole food plant-based (WFPB) diet, at about 10-15% fat. The WFPB diet, of course, also is rich in nutrients and related substances now known to prevent and/or reverse a wide spectrum of health problems—including obesity. The missing message in this film is that concerning the effects of a multiplicity of dietary factors/nutrients, which prevent a wide range of seemingly diverse diseases and which does so remarkably quickly—days to a few weeks. To explain the significance of this concept, I find it useful to group foods into three classes, animal-based, plant-based and processed or convenience foods. The benefits of these foods are best assessed by their nutrient contents, most of which were not mentioned in the film. It is very clear that for optimum health, we must consume a wide variety of antioxidants and complex carbohydrates (this includes dietary fiber) that are only produced by plants and that must be consumed as whole foods, thus giving the whole food plant-based (WFPB) lifestyle. Based on fundamental evidence from many years ago, this diet easily provides all the protein and fat needed for good health, as well as appropriate amounts of vitamins and minerals. It is the balance of these nutrients and their integrated functions that explains the exceptional disease prevention and reversal effects of this diet now being observed. In modern day parlance, this diet is anti-inflammatory, anti-oxidant, immune-enhancing, and capable of controlling hormone dependent aberrant cell growth (as occurs, for example, in cancer growth). These, and others, are very complex systems that account for the remarkable biological effects of the foods comprising the WFPB dietary lifestyle. Animal-based and processed foods have no capability for producing the same benefits. The ‘authorities’ in this film are mostly the same people who have been chanting the same mantra against the WFPB diet at other venues and in other media. They are making headway with the public, partly because they use reductionist argument and experimentation and partly because they have ready access to resources and supporters who want to maintain the present systems of food production and health care. This “Fed Up” film, aptly named from more than one perspective in my view, is an abysmal failure that lures unassuming consumers to ignore the big picture while mostly maintaining the present status quo. The film’s assertions have little or no credence or potential to resolve the health crisis (poor health, high health care costs) in the U.S.
Posted on June 17, 2014 by Health and Food MattersPosted in Disease, VIPsTagged disease, health.